Sometimes the real world is creepier than the Upside Down. "Stranger Things" costumes will certainly be a staple of this year's Halloween circuit for both kids and adults, but one off-brand version has people furious: "Upside Down Honey," a sexualized take on character Eleven. 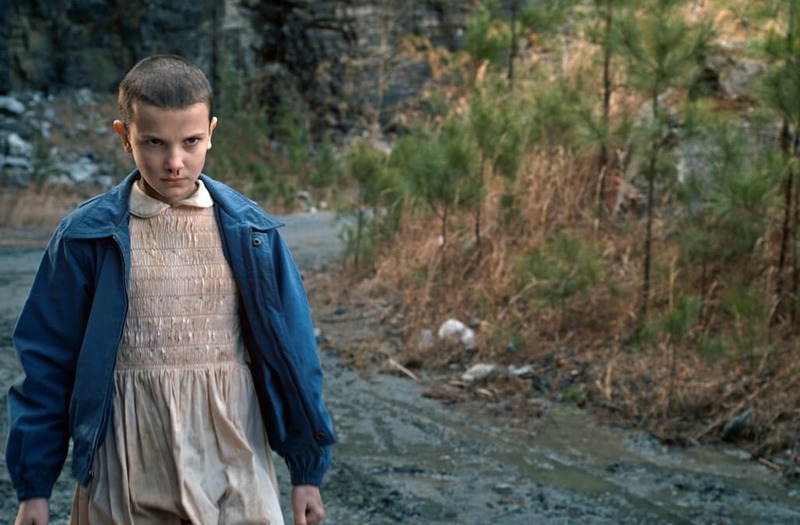 In the show, Eleven is a preteen; in real life, actress Millie Bobby Brown turned 13 this year. Twitter users who've come across the bizarre ensemble have been quick to speak out, with people saying they're "horrified" and "disgusted": She's "literally a child," one wrote. BIG LITTLE LIES: Five gal pals can easily become the leading ladies of "Big Little Lies." For Reese Witherspoon's Madeline Martha Mackenzie, think California preppy -- laid-back but polished in fall shades like burgundy -- or just pop on a Lulu Lemon ensemble. For Nicole Kidman's Celeste, carry two twin baby dolls; Renata (Laura Dern) requires a glass of red wine. Zoe Kravitz's Bonnie is all about earthy, boho vibes, and for the friend who hates putting together costumes, Shailene Woodley's Jane basically just wears sweats. CHARLI XCX'S 'BOYS' VIDEO GUYS -- Oh man (or should we say boy? ), there's a lot to choose from here. Dozens upon dozens of men are featured in the video, all with totally different personalities and styles -- which makes this the perfect choice for a group of guys hitting a Halloween party together. Fifth Harmony -- This girl group costume is for four ladies ready to rock some attitude and stilettos. Oh wait, you need to accommodate five people? Then one will have to be ex-member Camila Cabello, and she has to stand uncomfortably to the side in every photo, removed from the rest of the crew. PREGNANT KARDASHIANS -- Every year, groups of friends become the Kardashian clan for Halloween, but this year is special. This year, we have three pregnant Kardashians. So those lucky enough to play Khloe and Kylie can stuff pillows under their tops, and someone will have to be Kim's anonymous surrogate, standing next to her all night with a pregnant belly and a bag over her head. TAYLOR SWIFT'S 'LOOK WHAT YOU MADE ME DO' EVOLUTION -- You know you all want to do this. There are infinite Taylor looks to choose from, but her most iconic ones are all on display in her hit video. The more friends in your group, the more versions of Taylor you can put on display. 'STRANGER THINGS' SEASON 2 CAST -- A lot of people dressed up as the 'Stranger Things' cast in 2016, but by the time Halloween rolls around this year, you'll have a whole new season of inspiration. For the record, putting fake blood over your nose and holding a box of Eggos is so last year. Make the most of what Netflix has given us in 2017. 'THE HANDMAIDS' TALE': No need to drop major cash on red floor-length dresses and fancy bonnets. A quick trip to your nearest fabric and craft store should be all you need: Just get creative and drape a long swath of red fabric for a shapeless dress, and you can cut sheets of white foam paper for makeshift hats. EVOLUTION OF MILEY CYRUS: She's changed a lot over the years, so there's a lot to choose from. Start with her Hannah Montana days and go through the past decade, from that unforgettable 2013 VMAs performance to her 2017 beachy California aesthetic. Make use of wigs. It's all in the hair. 'GIRLS TRIP' -- If you and your girls are already hilarious, that's step one of becoming the 'Girls Trip' crew. You can take creative liberties with the outfits, but stilettos and hoop earrings are a must. THIS IS US -- There are plenty of characters to choose from here, so the more people you can rally up, the better. Worried people won't recognize your group look? Carry around boxes of tissues. That should get the message across. TAYLOR SWIFT VS. KATY PERRY -- It's time to take sides in the long-running Katy vs. Taylor feud. Both parties have a free pass to trash each other from across the room, but they also have to say things like, 'I've always adored her.' Additional group members can dress as the stolen backup singers that allegedly initiated the feud in the first place.